Let’s face it. If fitness isn’t fun, then it won’t last long in your routine! Enjoying the exercise you participate in is the key to staying fit for life. Here are some ways I keep my fitness routine fresh and fun. Invest in exercise equipment for home. It’s great to have a piece of fitness equipment you enjoy, like a spinner, which attaches to your bike and allows you to cycle in place. I like to make it a rule that when I watch my favorite TV shows, I work out to them. It’s a great way for me to indulge in TV guilt-free. Search on-line for used gym equipment -you’d be surprised at the deals you can find. You can also invest in refurbished equipment too. Take classes! There are so many different, fun classes offered at various gyms. Do some research to find out which types of class sound most appealing to you. Like dancing? Zumba is for you. Need to get out some aggression? Boxing is perfect. Use online coupons or special offers to take trial classes to figure out which workouts you enjoy the most. Working out around other people in class can be extremely motivating and fun, you never know who you’ll meet! Listen while you walk. Listening to books on CD, audible, or podcasts when walking on a treadmill or in a park can make the time fly! Make it a rule that you can only listen to that suspenseful story when you’re walking. Get outside! Exercising outdoors is a great way to keep fit, naturally! Being on a machine at the gym can make some people feel like a mouse on a wheel. Instead, step outside for a jog, a brisk walk in the park, or a satisfying hike. I hike weekly with friends and really enjoy pushing each other to go further or faster each time. If you have access to a swimming pool and warm weather, try to swim laps a few times a week. The fresh air will be invigorating and you’ll get a dose of Vitamin D from the sun! Recruit your friends. Most people enjoy exercising more when they are doing it with someone else. It’s also a great social activity with added motivation and a physical bonus! I use social accountability to stay active at my desk. There are a couple people I text with for daily fitness breaks –for example, “do 20 counter push ups”, “20 clams” or “20 chair squats.” I like that I get a text back, with additional exercise ideas. Join a team. If you were previously an athlete, you might enjoy playing a team sport for a little competition. Look at different recreational leagues offered in your area, and sign-up for one that suits your schedule! 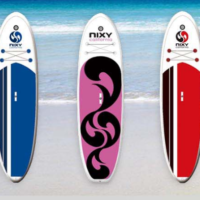 Or try a new activity like paddling –check out these super cool inflatable boards, by nixy. Make it competitive. Have a fun month-long competition with your friend, significant other, family member, or roommate. Mark down on a calendar whenever one of you works out, and the winner gets an award: dinner, new workout clothes, or simply bragging rights. Adding one of these ideas to your fitness routine will make it fun and more enjoyable. Share your favorite fun fitness ideas in the comments below!